Thought I’d better join in the pickle posts! Celia has been pickling lemons and limes here which look fantastic! Here is the Waitrose magazine version of a simple danish cucumber pickle. Fast and easy to make, keeps for about five days in the fridge. When I was little we used to visit my great Aunt Gerda in Denmark and she always had a white cucumber pickle that tasted just like this. I have never seen it in a delicatessen in England, but this taste brings back memories of mosquitos and long grass and a little wooden summer house in the wood. The cucumber becomes magically crunchy when you treat it this way. Good with any fish, particularly smoked fish like trout or eel. Take a fresh cucumber, give it a good wash. Take a fork and run the tines down the outside of the cucumber. Slice the cucumber thinly. Layer with a tablespoon of Maldon salt. Leave for ten minutes in a colander. Then rinse it well under a cold tap. Mix up golden castor sugar and white wine vinegar and add chopped dill. Proportions depend on how sweet/sour you like your pickle. Start with 70 ml vinegar to 40g g sugar and see how that works for you. Layer the cucumber in a sterilised jar, add the vinegar and sugar mix and chopped dill, give it a good shake and leave for a few hours before you try it. Sweet sour salty dill – lovely! 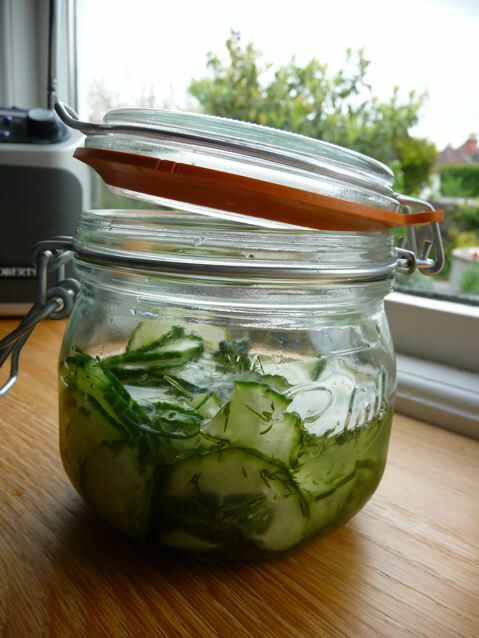 This entry was posted in Pickles, Recipes, Vegetables and tagged cucumber pickle, dill pickle, quick pickle on 07/05/2010 by Joanna. This sounds fabulous. I love sweet and salty together. I’d never really appreciated it before we moved to the States. They really embrace the sweet/salty combination here. And dill always picks up a boring salad. Celia, This is a quick pickle that will keep for maybe 5 days. It might keep longer but it would get sourer as time goes on. I would only make a small amount at a time and really there is no need to make more as it is ready so fast! Experiment with using chiles and peppers if that is what you like.